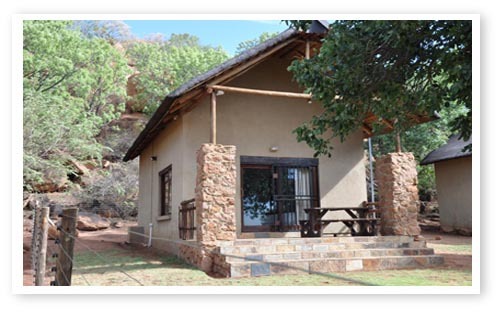 Granietkop Game lodge boasts luxurious, comfortable accommodation with an open and friendly atmosphere. 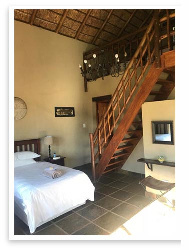 All accommodation is self-catering. 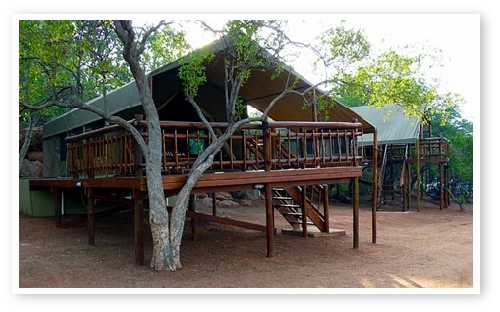 Accommodation is provided in: 2 lodge luxury rooms (each unit sleeps 4), 2 luxury tents (each unit sleeps 4), 2 luxury chalets (each unit sleeps 5). 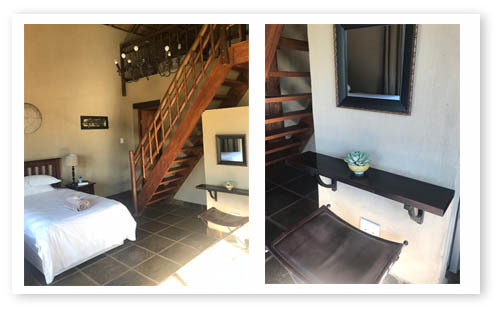 The main lodge (sleeps eight), consists of two privately situated en-suite rooms with one queen size bed and two single beds. 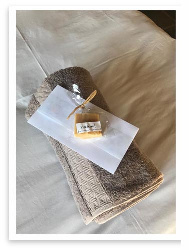 All linen, bedding, pillows are provided. 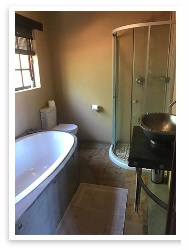 The bathroom has shower, bathing and sanitary facilities. The main area of the lodge has a large lounge with ample seating space. Enjoy a lovely meal in the dining area with it’s large table and chairs. A bar is situated very pleasantly in the centre of the room with a large screen TV, with full DSTV for those who cannot bare to miss there favourite program or sport event. 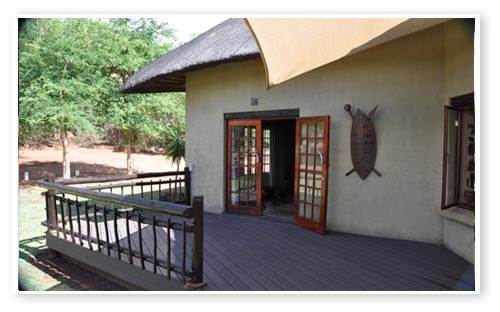 The braai boma overlooks a waterhole where you can experience sable antelope, Nyala and Black Impala up close and personal. 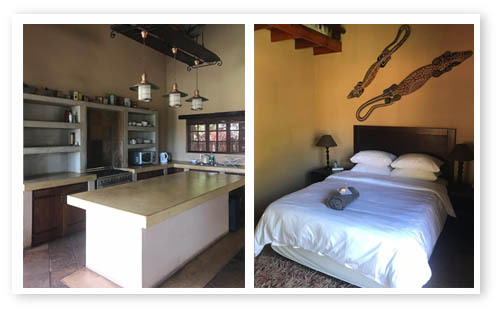 In addition to the main area of the lodge, there is a second entertainment area, with a gasbraai, swimming pool, pool table, darts and jacuzzi. 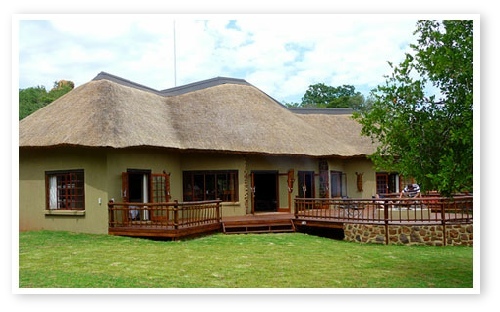 This area is ideal for a lazy brunch or a party function with spectacular views ot the Bushveld and idealic sunsets. 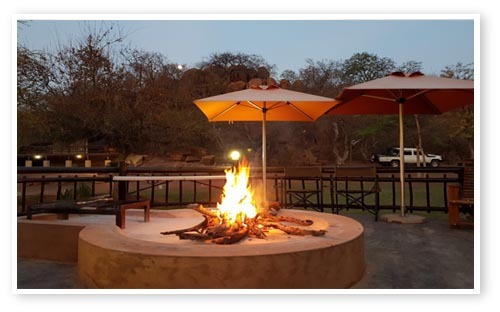 Enjoy a succulent piece of meat on the “braai” (barbeque) or just relax with a glass of your favourite drink on the spacious deck while the boma-fire is crackling away in the night sky. 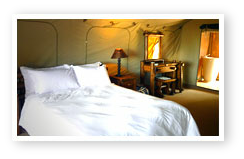 We have two luxury tents each sleeping four. Each room has a queen size bed and single upper-lower bunk bed. 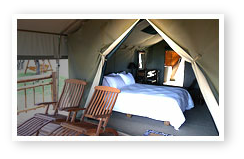 Each tent has an en-suite bathroom with full facilities. 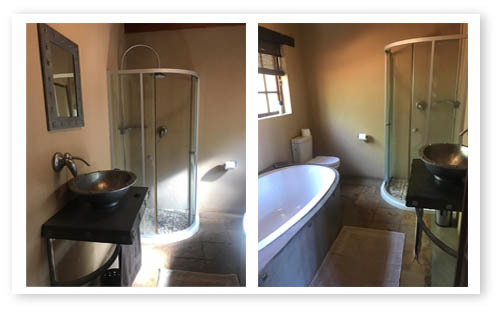 If you would like to savour the African sky, why not have a shower in one of two outdoor, privately situated showers. 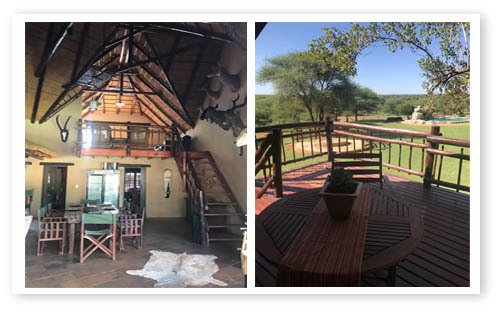 A well-placed deck enables you to watch the sun rise over the “graniet-koppies” (granite-stone mountain) or you may see sable antelope, Nyala and Black Impala gathering at the nearby waterhole to lather their thirst. Each tent has its own braai boma. 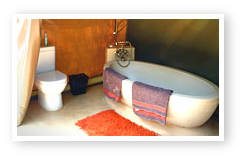 Each chalet has a kitchen and en-suite bathroom with a bath and shower. Sleeping arrangements are a queen sized bed downstairs and 3 single beds on the loft. Can be arranged as 5 single beds in the unit. Each chalet has its own braai boma. Hunters can enjoy bow hunting for venison or biltong or perhaps a well-deserved trophy. We provide enjoyable game drives throughout the day or for the early bird at dawn and for the romantic, at sunset. We have various trails on the farm to enjoy a leisure cycle or quad bike ride. 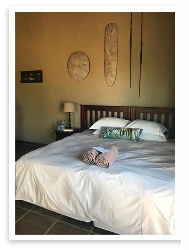 Copyright Granietkop Game and Bow Hunting Lodge © 2019. All Rights Reserved.